Randomly chosen items or values are important in many games. This sections shows how you can use Unity’s built-in random functions to implement some common game mechanics. Note that Random.Range returns a value from a range that includes the first parameter but excludes the second, so using myArray.Length here gives the correct result. You can visualise these different outcomes as a paper strip divided into sections each of which occupies a fraction of the strip’s total length. The fraction occupied is equal to the probability of that outcome being chosen. Making the choice is equivalent to picking a random point along the strip’s length (say by throwing a dart) and then seeing which section it is in. …to a less-than-or-equal test would avoid the extra return statement but would also allow an item to be chosen occasionally even when its probability is zero. The array of floats method works well if you have discrete outcomes, but there are also situations where you want to produce a more continuous result - say, you want to randomize the number of gold pieces found in a treasure chest, and you want it to be possible to end up with any number between 1 and 100, but to make lower numbers more likely. Using the array-of-floats method to do this would require that you set up an array of 100 floats (i.e. sections on the paper strip) which is unwieldy; and if you aren’t limited to whole numbers but instead want any number in the range, it’s impossible to use that approach. A ‘raw’ random value between 0 and 1 is chosen by reading from Random.value. It is then passed to curve.Evaluate(), which treats it as a horizontal coordinate, and returns the corresponding vertical coordinate of the curve at that horizontal position. Shallow parts of the curve have a greater chance of being picked, while steeper parts have a lower chance of being picked. A linear curve does not weight values at all; the horizontal coordinate is equal to the vertical coordinate for each point on the curve. This curve is shallower at the beginning, and then steeper at the end, so it has a greater chance of low values and a reduced chance of high values. You can see that the height of the curve on the line where x=0.5 is at about 0.25, which means there’s a 50% chance of getting a value between 0 and 0.25. This curve is shallow at both the beginning and the end, making values close to the extremes more common, and steep in the middle which will make those values rare. 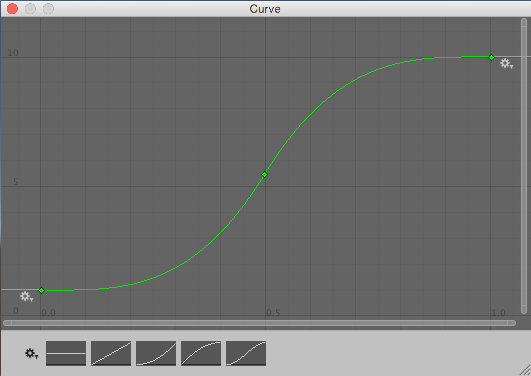 Notice also that with this curve, the height values have been shifted up: the bottom of the curve is at 1, and the top of the curve is at 10, which means the values produced by the curve will be in the 1–10 range, instead of 0–1 like the previous curves. Notice that these curves are not probability distribution curves like you might find in a guide to probability theory, but are more like inverse cumulative probability curves. See in Glossary window visually, instead of needing to calculate values. This technique produces floating-point numbers. If you want to calculate an integer result - for example, you want 82 gold pieces, rather than 82.1214 gold pieces - you can just pass the calculated value to a function like Mathf.RoundToInt(). A common task is to pick a number of items randomly from a set without picking the same one more than once. For example, you may want to generate a number of NPCs at random spawn points but be sure that only one NPC gets generated at each point. This can be done by iterating through the items in sequence, making a random decision for each as to whether or not it gets added to the chosen set. As each item is visited, the probability of its being chosen is equal to the number of items still needed divided by the number still left to choose from. // Adding 0.0 is simply to cast the integers to float for the division. Note that although the selection is random, items in the chosen set will be in the same order they had in the original array. If the items are to be used one at a time in sequence then the ordering can make them partly predictable, so it may be necessary to shuffle the array before use. This gives a point inside a cube with sides one unit long. The cube can be scaled simply by multiplying the X, Y and Z components of the vector by the desired side lengths. If one of the axes is set to zero, the point will always lie within a single plane. For example, picking a random point on the “ground” is usually a matter of setting the X and Z components randomly and setting the Y component to zero.